A young male with unknown medical history is brought in by ambulance with altered mental status. EMS reports that the patient was agitated, requiring restraints for transportation. On arrival, the patient is agitated, uncooperative and unable to provide history. Vital signs are notable for tachycardia, tachypnea and hypertension. Physical examination demonstrates diaphoresis and mydriasis, as well as increased muscle tone – particularly in the lower extremities with ankle clonus. A core temperature is obtained and noted to be elevated at 41.5°C. Point-of-care glucose is normal. Rapid external cooling measures were instituted and several doses of intravenous benzodiazepines were administered with improvement in agitation. Laboratory studies were notable for a modest leukocytosis (WBC 18.4 without immature forms), serum sodium was 135 without osmolar gap, creatine kinase was slightly elevated without renal dysfunction, and thyroid function tests were normal. Toxicology screen was negative. ECG revealed sinus tachycardia but was otherwise normal and non-contrast computed tomography of the head was normal. After a brief admission in the intensive care unit, the patient’s mental status improved and he reported MDMA use on the evening of presentation, he also described a history of major depression and was taking paroxetine. The designation of 38°C as “suspicious” for fever dates to 1868 and the analysis of over one million (axillary) temperature measurements by Carl Wunderlich1. Any cutoff is arbitrary and requires recognition of the clinical context and normal daily variations (with nadir in the morning and peak in evening) 2,3. What is clear is that peripheral thermometry (unless demonstrating fever) is unreliable and a core temperature should be sought4. Temperature homeostasis is a balance between heat production and dissipation maintained by the anterior hypothalamus. Heat production is a byproduct of normal metabolic processes and skeletal muscle activity. Conservation, maintenance or dissipation of heat is aided by cutaneous vasodilation, sweating, or behavioral responses. Fever is caused by endogenous or exogenous pyrogens which alter the homeostatic set-point, inducing thermogenesis and elevating the body temperature. Precipitants of fever are usually infectious, however non-infectious processes (ex. malignancy, tissue ischemia/infarction, auto-immune disease) resulting in inflammation can provoke a similar response 5-7. There is no explicit temperature distinction to diagnose hyperthermia, instead the physiologic mechanism is different. In hyperthermia, the body’s homeostatic mechanisms are dysfunctional or overwhelmed due to heat exposure, excess production, ineffective dissipation or hypothalamic malfunction 8. Wunderlich CA. Das Verhalten Der Eigenwärme in Krankheiten. 1870. Mackowiak PA, Wasserman SS, Levine MM. A critical appraisal of 98.6 degrees F, the upper limit of the normal body temperature, and other legacies of Carl Reinhold August Wunderlich. JAMA. 1992;268(12):1578-1580. Lee-Chiong TL, Stitt JT. Disorders of temperature regulation. Compr Ther. 1995;21(12):697-704. Niven DJ, Gaudet JE, Laupland KB, Mrklas KJ, Roberts DJ, Stelfox HT. Accuracy of peripheral thermometers for estimating temperature: a systematic review and meta-analysis. Ann Intern Med. 2015;163(10):768-777. doi:10.7326/M15-1150. Dinarello CA. Infection, fever, and exogenous and endogenous pyrogens: some concepts have changed. J Endotoxin Res. 2004;10(4):201-222. doi:10.1179/096805104225006129. Greisman LA, Mackowiak PA. Fever: beneficial and detrimental effects of antipyretics. Curr Opin Infect Dis. 2002;15(3):241-245. Dinarello CA. Thermoregulation and the pathogenesis of fever. Infect Dis Clin North Am. 1996;10(2):433-449. Simon HB. Hyperthermia. N Engl J Med. 1993;329(7):483-487. doi:10.1056/NEJM199308123290708. Boyer EW, Shannon M. The serotonin syndrome. N Engl J Med. 2005;352(11):1112-1120. doi:10.1056/NEJMra041867. Berman BD. Neuroleptic malignant syndrome: a review for neurohospitalists. Neurohospitalist. 2011;1(1):41-47. doi:10.1177/1941875210386491. Hayes BD, Martinez JP, Barrueto F. Drug-induced hyperthermic syndromes: part I. Hyperthermia in overdose. Emerg Med Clin North Am. 2013;31(4):1019-1033. doi:10.1016/j.emc.2013.07.004. Oruch R, Pryme IF, Engelsen BA, Lund A. Neuroleptic malignant syndrome: an easily overlooked neurologic emergency. Neuropsychiatr Dis Treat. 2017;13:161-175. doi:10.2147/NDT.S118438. Musselman ME, Saely S. Diagnosis and treatment of drug-induced hyperthermia. Am J Health Syst Pharm. 2013;70(1):34-42. doi:10.2146/ajhp110543. Ahuja N, Cole AJ. 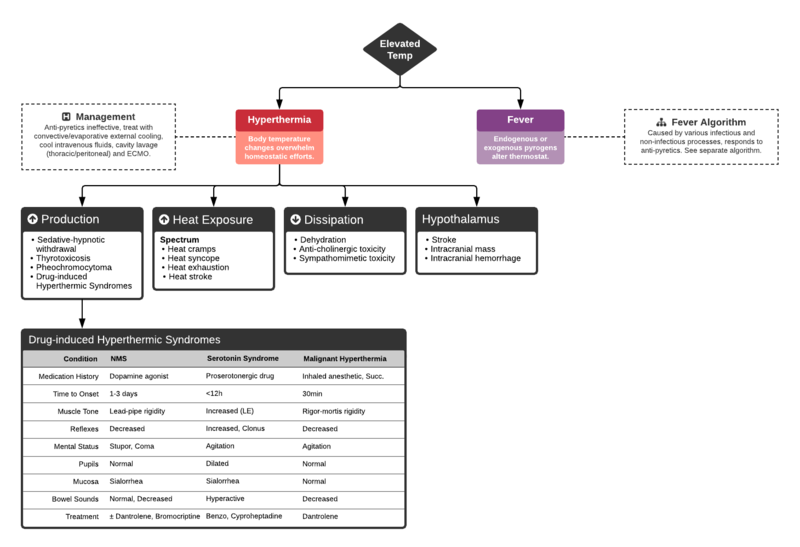 Hyperthermia syndromes in psychiatry. Adv psychiatr treat (Print). 2018;15(03):181-191. doi:10.1192/apt.bp.107.005090. Tomarken JL, Britt BA. Malignant hyperthermia. Ann Emerg Med. 1987;16(11):1253-1265. doi:10.1016/S0196-0644(87)80235-4.